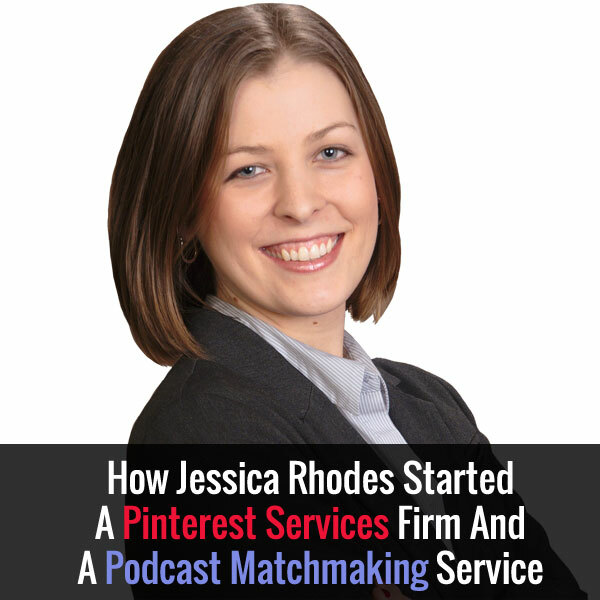 Jessica Rhodes owns 2 thriving business service companies, EntrepreneurSupportServices.com and InterviewConnections.com where she helps businesses with Pinterest and podcasting. Jessica is a Pinterest expert and she reveals many useful tips on how to market your business using Pinterest in this episode along with many helpful tools that she uses to streamline the process. In addition, she provides some meaningful advice on how to network with others and how she acts as a matchmaker for podcast interviewers and interviewees. You are listening to My Wife Quit Her Job podcast where I bring in successful, bootstrapped business owners, to teach us what strategies are working and what strategies are not. Now this isn’t one of these podcasts where we bring on famous entrepreneurs simply to celebrate their success. Instead I have them take us back to the beginning and delve deeply into the exact strategies they used early on to gain traction for their businesses. If you enjoy this podcast please leave me a review on iTunes and enter my podcast contest where I’m giving away free one on one business consultations every single month. For more information go to www.mywifequitherjob.com/contest, and if you are interested in starting your own online business be sure to sign up for my free six day mini course where I show you how my wife and I managed to make over 100K in profit in our first year of business. Go to www.mywifequitherjob.com for more information. Now onto the show. Steve: Welcome to the My Wife Quit Her Job podcast. In this episode I’m going to be talking to Jessica Rhodes. Now I actually met Jessica when she reached out and emailed me out of the blue, and what I often do when I get an email is I usually check out that person’s website or business if I find them interesting. And Jessica’s story immediately struck me because quite frankly, I have a soft spot for people who quit their jobs to start a business, in order to spend more time with family. Now Jessica owns two businesses, Entrepreneur Support Services and Interview Connections. Now, ESS for sure is a virtual assistance from but her main service is interview connections where she works with podcasters to find and book guests for interview shows. And so when I heard about this I was like aah, wait a second I run an interview based podcast, I need people to interview for my podcast and Jessica sounds like she runs a business that’s in high demand. Now this woman also is a Pinterest expert, so we’ll be talking about Pinterest a little bit today, and she does infographics and she has a wide allay of talents and I brought Jessica on today to talk about how to start a business that kind of relies heavily on networking and being able to connect people to one another incidentally which are skills that are very necessary for success in any business for that matter. So Jessica welcome to the show and really happy to have you here. Jessica: Oh Steve I was so excited to be here. When I first saw your podcast up there I knew it no worthy my wife quit her job, I thought my husband can say my wife quit her job because that’s exactly what I did when I had my baby because just like you said I ran my business so that I can be at home. So I was so– I’m like thrilled to be on your show today. Steve: Yes however the domains is already taken if you were thinking about starting that blog. So, I’m actually really interested in hearing about your background story because it kind of parallels my own in away. So tell me how you got started with your business and I really want to hear about what was going on through your head especially when you became pregnant. Jessica: Yeah, definitely. So well what I did before I started my business is totally different than what I do now in some ways and in some ways it’s very similar. So just to give you back I’m 26 years old and when I was 19 in college I got a job in a non profit going door to door raising money. So– and I did that for the next six years. I worked kind of my way up and became a manager pretty quickly and then when I graduated college, I became director of my own staff and that’s what brought me here to Rhode island. So, I did that for a few years and it was a position that I really loved, I really loved the organization. I was an activist at heart fighting for clean water and clean air and the money– I was really never motivated by a lot of money and anyone that works in non profit knows that you don’t do it for the money. But you know I’m married and when my husband and I decided that we wanted to start thinking about having kids, I knew that I want to be a stay at home mum. My mum was a stay at home mum, my husband’s dad was actually a stay at home dad. So we both had when we grew up a parent that was at home with us and this was really, really important to me. Now my husband also works in a non profit, so we in no way were able to buy a house and support a family with just one salary, a non-profit salary at that. So I actually had a conversation with my parents– I’m really close with my mum and my dad and told them that I want to be a stay at home mum. And just to keep in mind when I got pregnant I didn’t have– I didn’t know what my plan was going to be, so I kind of threw myself into it and made myself figure it out. Steve: So you didn’t have a plan when you quit? Jessica: No, well yeah– no I didn’t. Steve: Wow, okay all right. Jessica: Yeah I got pregnant in the summer in June, I told my boss that I would be leaving. I told him when I was three months pregnant, so I said in six months I’m leaving and at that time I did not know what I was going to do. Jessica: But I am like I guess just very optimistic and knew that I would figure it out. I am thankful that I never had really hard times in my life, I mean we never had a lot of money growing up but I never went without food or a house, so I just kind of blissfully assumed everything would work out. And it’s kind of like I guess that is the entrepreneurial bug I have it’s like starting a business it’s like jump– I saw a crew once, so it’s like jumping up a cliff and then building the parachute as you are going down and that’s kind of like what it was. And my dad is actually– he’s a business coach, he is an entrepreneur that works out of a home office. So he is the person that told me what a virtual assistant was. I had no idea what it was, the only term I knew of VA was you know [Inaudible] [00:06:01] interference. I had no idea that this whole industry even existed. I had no idea there was this whole network of people that were creating great revenue online working from home and creating a lifestyle. I thought the only people that were rich were people that worked their way up in corporate. So, I mean it was– I mean my eyes were just opened up dramatically when I learned about this whole industry and this whole business world. So my dad taught me how to be a virtual assistant, he brought me on as one of his VA just so like to get started, get my feet wet. I got s new computer just like to start doing some admin work. When I had my son– my son was born in March– my last day at my job was two days before he was born. Jessica: I worked up until the end, I was doing part time virtual assistant work for my dad’s business while I was pregnant, so just to kind of start getting used to it and then when my son was born I had two weeks where I recovered from giving birth. And then I got back into work two weeks later and that’s when I just started really ramping up my business, and I took on my first client outside of my father a couple of months later and it’s just kind of the rest is history I guess. Steve: So a couple of questions for you. So, first of all how did you get that first client and then how did you kind of steer your services kind of towards Pinterest? Jessica: Sure, okay great question. So, my dad introduced me to– so my dad as my technically my first client, I was doing really great work for his Pinterest account. Now he told me upfront, you know I’m going to take you on because you’re my daughter and I think you will be a really good asset to my team but I’m only going to keep you if you are adding value. So I knew that my dad is an old fashioned guy, he was not just going to keep me on just to be nice. So I knew I had to do really good work, so I took a whole Pinterest course, I worked on his Pinterest marketing, brought his Pinterest following from a few hundred to over a thousand, created tons of pins and just really made a name for myself there and he has a pretty big following. So obviously being his daughter but also being somebody that was adding a lot of value to his business. He posted on Facebook that I started my business and that I’m doing really good work with Pinterest. A friend of his Jason Silverman is the CEO of Powerful Words Character Development which is a business providing character education systems to after school activity centers like [Inaudible] [00:08:31] and dance and gymnastics. And so when he saw my dad post about how he added– he had somebody doing some Pinterest work Jason reached out to me, and set up a phone call and I talked to him about what I can do for him and he said all right I’m going to give you a shot. And Jason has actually never left, he is still my client today and we’ve done really great work with his Pinterest account. And so fro along time every client I got were just referrals. Steve: I know how that feels. Jessica: So the web– when people say you need a website– well you don’t really need a website. It’s helpful but the referral is the most powerful way to get clients and so that’s really how I built my business early on. Steve: Okay, so let’s talk about the Pinterest work that you do. So what do you do to actually expense someone’s account, because I know my audience is very interested in the way Pinterest works, and how to create a really powerful Pinterest account? Jessica: yes Steve, this is definitely something that your audience– I assume most of your audience are in e-commerce and have products and image based businesses. Well, Pinterest is the account that they want to be on because it’s an image based platform. It’s also– the difference between Pinterest and platforms like– any other platform, Facebook, Twitter [Inaudible] [00:10:05] I guess instagram is more similar but there is not really direct messaging back and forth between users. You can comment on pins but people really go on Pinterest to find things that they are interested in, so you can look for things about kids, things– people go to Pinterest basically to find things that they want to buy. I mean, I go to Pinterest and I look at the home décor section, and I look at things that I want to buy if they look nice. And so it’s all about images and it’s all content. Now, over 80% of the content on Pinterest meaning the pins are re-pins, so if you can be that 20% that is adding new content to Pinterest meaning you uploaded image and then link it to you website or whatever that image should be linked to, you are adding content and then the magical thing about Pinterest is that thousands and millions of people then take that pin and they re-pin it on their boards, and then all their followers see it and they re-pin it on their boards the name. I met my client Jason, now we’ve been going for over an year now that we’ve been working on his Pinterest account and we love going in there you know 70 notifications of all these people ripping in his infographics and ripping in his pins. And so it’s very powerful if you add– and you want to make sure that you are creating pins and graphics that are eye catching. So, couple of things, some writer downers here that you want to think about when you’re making pins is a pin that’s going to be eye catching, so a graphic that’s you know a high quality photo, something like a stack photo or– and something with text. So we’re using text overlay or call to action. So you just have a photo of a woman sitting at the desk, well at first thing you have no idea what that’s about. But if you add text overlay with something like PicMonkey.com or any type of photo shop, you can have a caption that says “how to become a virtual assistant”. But the woman sitting at the desk, people look at that immediately and when I click through to learn how to become a virtual assistant. So that shows one example of how adding text to an image is going to grab more attention, and tell people exactly what they can find behind that pin. Steve: Okay, let’s say I’m a brand new shop owner, because I would understand that Pinterest is probably a little bit different for someone where you’re actually guiding them to a product, what would your strategy be for like a brand new store on Pinterest? Jessica: Right, on Pinterest you want to think about what kind of boards you have. So give me an example Steve, like what kind of shop, what kind of products are we talking about? Steve: Okay, so let’s– I’m in the wedding industry. So let’s say wedding related products. Jessica: Oh my gosh, perfect guinea to be on Pinterest. So, okay wedding industry. Are you selling like wedding shoes, wedding accessories, I guess all of the above? Steve: Wedding accessories. We are actually heavily on Pinterest, so I’m just happy that you’re speaking what your strategy would be, so we’re so hectious [phonetic] actually, so a little [Inaudible] [00:13:01] handkerchiefs where you can put the bridegroom in on the wedding day. Jessica: Yeah, so you want to have all different kinds of boards just about weddings, you know the wedding day, really photos of people with the handkerchiefs on the wedding day. You want to have boards also not just about your product, I mean obviously you want a lot of your pins linking back to your store, your website but you also want to be built to gap your profile with just images that your target audience is going to be interested in. So just re-pinning images from other wedding websites through having a board about wedding dresses or about shoes, may be a board with to do verse about what to do leading up to the wedding. So your whole page is for– and I’m sure you got this down part, sounds like you’re already doing more of Pinterest, but just to give the listeners an idea, you want to think about everything that your product could be related to, so what we do with– one example with my client Jason– his clients are martial arts school owners. So they provide services and graphics for kids who want to take martial arts classes. Well they can also have a board on their Pinterest page with– that will link to products and services that have to do with martial arts, but maybe not something that they personally offer, so it’s kind of like a referral partnership there. So just think about everything that your target audience is interested in and you want to be that go to Pinterest page that they look at to get inspiration, to get product ideas and to get tips and things like that. Steve: So once you have kind of like the basis for your boards laid out, how often do you actually have to pin new items and what’s– how do you kind of break it down between the amount of pins that you actually pin that lead to your website versus re-pins of other people’s stuff? Jessica: Well the burden cut a lot of different tips and it kind of depends on what your pins are, so I’ve heard people that 80-90% of their pins are their own products and they go back to their own website, and I think that’s fine as long as your pins are actually something that your followers want to be seeing, but I think it’s really important to– so I think the 80-20 rule really applies here well you know 80% especially if you’re on there as a business, as a store you know 80% being your own pins, and then 10-20% being re-pins from other Pinterest users. Steve: Okay, interesting. My wife actually runs our Pinterest account, I don’t really touch it, so I’m kind of speaking as if– you know I’m learning stuff here myself. So my wife has actually taken the opposite approach, 20% of our stuff that she pins and then 80% other people’s stuff so. Jessica: Pretty good, so there is no hard and fast rule. Steve: Okay and I was just curious what’s the distinction between a business Pinterest account versus a regular Pinterest account? Jessica: So, there’s really no difference to somebody that’s– I can look at two Pinterest pages and I would have no idea one was a business page or one was a personal page. Now the way it changes but last time I checked which is not that long ago, the only difference is as a business account– if you have a Pinterest page as a business account, you can enable the activate– this is the word I’m looking for– activate the analytics feature, and that will if you verify your website which means you click verify when you’re in the settings I believe and then you put that code into your website. I usually have a web person do this for I’m not the most techie individual but verify your page it’s pretty common– they give you step by step directions. You verify that, it gives you a little check mark next to your website and then that kind of connects your Pinterest page to your website so they can tell you what pins are being re-pinned the most, how many clicks through to your website you’re getting. So, that’s where you want to have a business page is so that you can activate those analytic features because as a personal user you don’t care, how many click throughs to each website. Jessica: So that’s the main difference but it’s but it doesn’t really look any different from the users’ perspective unless of course you actually use the business name and a business logo but you could do that with a personal page too. Steve: Okay, cool. So you know, I know for a fact that you told me early on when we were chatting the you actually create graphics also for your clients. So what are some tips on– you do infographics, what are some of tips on kind of formulating the image that you want to post online? Jessica: Sure, so I mentioned over either with pins you know first of all let’s talk about the size requirements so on Pinterest, I’m on the main feed 600 pixels wide is as wide as you want to go. Now if you do 800 to maybe 1000, they’ll resize it but they are preventing larger than that they’ll tell you error and it won’t show up. So 600 pixels wide is what you want and then infinite however long I don’t– last I checked there was not really a limit to how long it can be. If it’s super long like 300 pixels long, what they’ll do is they will crop it so on the main Pinterest feed it’ll say expand pin, they won’t show it all right there. But this is exactly why infographics are really useful and powerful on Pinterest is because they take up more [Inaudible] [00:18:18] on that main feed. Now I really pulled it an infographic that’s very long and they can take up lots of space may not get as much attention as very well done 600 by 600 pixels square pin. So there’s you obviously have the key to see a big picture, it has to be good. Infographics are really powerful because people go on Pinterest to find inspiration, to find tips, to find things that are of interest to them. I mean specifically in the wedding industry, if you have an infographic with the top ten that brides need to do on the day before they get married– I’m totally just making this up as I go but– and then it’s a cool you know it has images, it has text, it’s a colorful background and that information is right there, people are drawn to it more. So, those are really effective, now you make infographics– there are a lot of great sites that give you kind of templates. So, when I first started out I was using Picto Chart. Now PictoChart.com has a free version where you can– they give you templates and you scan and insert the text that you want to be using, they give lots of cool designs so it’s really blended easy for someone that has no graphic design background. The free version will have the Picto Chart logo at the bottom. Either you quickly upgrade it to the pay version because you don’t want to be creating infographics for clients and having Picto Chart on the logo. Jessica: and so that’s good but now I use a graphic designer so they are all custom made and they look a lot more professional you know because if you use Picto Chart you are going to start seeing them on Pinterest, you can tell that was used on Picto Chart, I recognize that theme. Jessica: So that’s something to think about. I mean it’s really only the train die and somebody who also makes infographics is probably going to recognize that, but I think the best thing in graphic design software works with infographics is custom built is going to make you stand out as really professional service or professional company. Steve: So what software do you use? Jessica: So I have a graphic designer that uses adobe illustrator. Steve: Okay so she actually draws. Jessica: Yeah, she creates them from scratch, so it’s pretty awesome. Steve: So any tips on what you would write in the description of the pin? Jessica: Cool, so there are two schools of thought with the description. Number one of descriptions that are much longer get more attention in the pins, so if you’re just browsing the Pinterest feed, there is a rule on description that I’ve heard that more people would be attracted to reading what it’s all about. But a shorter description that is very to the point will come up more in search results. So, I’ll give you an example– I made an infographic for my client and it was about– it had business success tips from a book that he wrote, and the pin description was just business success, just those two words. Well when you search business success which are probably very common– that’s commonly searched, it was the top and it might still be I haven’t checked in a while but it’s the top infographic in that search. So when you really– when you make your pin description something that you think people will be searching for exactly, then it’s going to come up in search results, so it’s a really powerful way to optimize your pins. But on the other hand you also want to be having a lot of hash tags. It’s important to also have the UR for where you are linking your pin to in the pin description. So not only people can– not only can they click on the pin to get to your website but they can also click on the description– on the URL within the description. So there’s a couple of different ways that you can go about it. Steve: Okay, all right great you know I wanted to talk about your other businesses too but yeah thanks so much for that Pinterest overview and the tips, I’m sure that my listeners will find valuable. So let’s talk about interview connections because I’m quite interested in that as well. So how does the business work exactly and how do you– because this is kind of chicken and egg problem right. Any business that connects people to one another– you either have to know a lot of people in order to attract the clients or you need a lot of clients that are looking for interviewees where you can attract people in your database. So how does it work? Jessica: Great so that’s just as Steve I mean hit the nail on the head, you either need a big database or you need to know a lot of people, there needs to be a need. So I didn’t launch interview connections until I was booking podcasts for individual clients for several months building up my database and making sure there was a need in the market place. So one of the– I mentioned where I had a couple of clients early on in my virtual assistant business. One of the services I was offering to them was I was getting them booked on other shows, so just like I reached out to you Steve and I said “oh my client would be a great fit for you”. I was doing that as one of the first tasks that I did for my clients and when I was doing that a year and a half ago, podcasting was so kind of getting big, drummy do biz wasn’t [Inaudible] [00:23:09] you know it was still kind of getting popular, and podcasters started asking me who I was because they said well whenever I book an interview I reach out to the guest directly or the guest directly makes a connection with the podcaster and they just– there was nobody in between making the connection. So after I had a lot of people ask me about what I did and kind of inquire about my services, I just realized that there is an opportunity here you know nobody else is doing this, podcasting is becoming really popular, there are a lot of entrepreneurs who want to be interviewed because it’s a great way to get exposure, it’s a great way to make connections and build relationships. Podcasters need guest and they don’t– you know because I like to really focus on podcasters that are small business centers that use the podcast as part of the content marketing platform. And I do work with some podcasters who want their podcasts to be their main source of revenue but I focus more on the entrepreneurs who use their podcasts as just like their blog or their videos and they– and those individuals don’t want their podcasts take up all their time. It’s a way to market their business but it’s not something that they want to be spending a lot of time on, so by obviously hiring a virtual assistant like myself who specializes in booking guest interviews, that was a really good fit. So once I figured out there was need in the market place, I worked with my dad who is my business coach and his web team. We got the website up and going, launched it under insanely Mobley because I had no idea what people were going to be paying for it, so my first levels were $47 a month and $77 a month. Today they are 197 and 297 because when people are paying for it you keep raising the prices till you get resistance. And so that’s just what I’ve done over the past years, I just keep improving the service and every interview I book, it’s a new connection that I’ve made and a new relationship that I’ve made I mean since meeting you Steve we’ve booked a couple guests on your show, and I think I’ve booked you on some shows. So that shows the power of– and I’m so– do that because that not only helps you get more exposure but it helps my– you know my clients need people to interview. So I have just really gone crazy with building a database, I’ve got a ginormous group of spreadsheet with people that are great guests. And you know like I mentioned in the beginning of the interview, what I did before this was go door to door so I’m just a natural kind of doing this cold course. Steve: Yeah and first of all I really appreciate the connections that you’ve made for me and then I thought I just point out to my listeners kind of something that you did in your email that kind of caught my attention. When you actually pitched me for one of your clients, you actually mentioned someone that I knew who actually knew your client and usually I get a lot of these pitches for interviews ever since I started my podcast, and I tend to ignore them. But the reason I paid attention to yours is because you mentioned Billy Murphy, and then immediately I reached out to Billy and said hey do you know this guy and then Billy said yeah, you he just moved in my building what not. And so that’s kind of what spurred me to action. Jessica: Exactly, that’s something that I teach all the time Steve to my clients is you have to– this is all about building relationships and when a cold email comes there or a cold call comes in and you have no connection to the person well you know maybe they are a great guest but it’s kind of a crap shoe, you don’t know. And so I do, I like to look for people that we have in common because I knew that if you ask Billy Murphy what he thought of Brian, he will say Brian is a great guy and successful, he would be a good guest. So adding that credibility factor and just finding that common ground it just shows how connected we all are, we just have to find those connections. Steve: Yeah, incidentally that’s another topic I kind of want to go into, so how do you network with people and do you kind of have any tips to share on how you meet people and kind of expand your network? Jessica: So I really have invested in life events, I try to go to at least once a quarter, so four times a year an out of the life event and just meeting people face to face is such a powerful way to build relationships. Now you can obviously you’re going to get a larger quantity of connections when you’re online, but then going to life events and making those connections deeper relationships is super powerful. And when I’m at those life events I make a point to just– when I meet people focus on what they do. Now I have– I went to New Media Expo and I met a ton of people, obviously it was tons of podcasters and they wanted to mob in big connections, but every interaction I make sure even if they stop by saying what do you do, I always try to table immediately “so tell me what you do first” because if I’m going to tell them about my business or what services I offer, that needs to be tailored to their needs you know. Like I mentioned somebody who is a small business owner and they need somebody to help them find guest interviews to have a weekly podcast to help market their current business, is a very different client than somebody that comes to me and wants a daily podcast to make sponsorship revenue. So different conversations I need to have with each person, so what I make sure I do is that I always ask the other person about them “tell me about yourself, tell me about your business”. People who are talking about themselves– I mean if you want someone to like you, just talk about them. Steve: So you are a good listener. Jessica: Yeah, I mean definitely I mean I like to think so, I don’t know if my husband would tell you that, but that is– if I had one tip for building relationships and networking, is just focus on the other person, just focus on building relationships, don’t be too hungry for– you know I met somebody I don’t even remember their name, so I won’t pull them under the bus, but it was just– it was at the New Media Expo and they just– I couldn’t leave the room because they just kept talking and talking and talking about their business, and I was so just bored to tears and just felt like it was just the worst conversation and I’m like stop talking about yourself. I mean I don’t– personally care anyway to ask about your business and now you’re just going on and on and on and on. So just really focus on the other person, if they want they want to know anything about you, they will ask specifically, and then you can answer the questions. Steve: Yeah, I mean I’ve been to conferences myself where people are just kind of hand you their business cards left and right. Steve: Usually, well unless I’ve actually had a good conversation I usually kind of shack the business cards in the trash. Jessica: Exactly and I feel part of that because I think there are some very shy and you’ve heard of people that go to conferences because they are trying without the comfort zone but they don’t have the confidence to walk up and just have conversations, so I have people just kind of like “here’s my business” card and I’m like all right man, I mean I don’t know what to say I don’t have any reason to keep your card. But, yeah just having those conversations first and then willing fully ending that conversation and hand over the business card, if you feel like it’s going to go somewhere with them. Steve: You know what’s funny is if I’ve had a good conversation I really don’t need a business card, I already fully remember that person and I’ll look them up later. Steve: So which conferences do you go to and which do you recommend specifically for businesses? Jessica: Sure, well I go to Glazer Kennedy Insiders Circle, are you familiar with GKIC? Jessica: Okay, it’s a marketing organization, really old school, direct sales, direct marketing, drop response marketing. So I go to their info summit every fall and that’s the conference all about information marketing and you know marketing in general and then I go to their super conference which is on the spring, and that’s kind of a bigger more general marketing conference. Dan Kennedy is the co-founder of that organization and he has since sold that but he comes back and speaks there and Dan Kennedy is– he’s kind of this like old, like kind of Massachusetts state guys, I’ll use that’s perfect– it gives off someone that whole difference that probably but he is absolutely the most brilliant marketing mind I’ve ever met. Read all his no bias business books, they are– I mean they are the reason that I have been successful in my business. That and my business coach, but my business coach my dad had learned basically everything he knows from Dan Kennedy. So I always go to the GKIC conferences because you always going to get straight off business marketing information. And then New Media Expo is definitely a conference that I go to because those are my people podcaster, bloggers, all my marketing types and then I’m going to podcast movement, I’m actually moderating a panel of podcast movement, the section on how to promote your podcast, I am going to be moderating a panel what we are going to talk about you know social media and different ways to get your podcaster locally and so I’ll go into that. And then the last one is dream business academy. Now dream business academy is my coach’s life event that he does twice a year, and it’s a seminar with about 30 to 50 entrepreneurs and it’s all about how to create a million dollar platform on a shoe string budget, and I speak there about how to get interviewed and how to build your business with interviews and media exposure. Steve: Okay, so that last conference sounds very intimate, it’s only a handful of people. Jessica: Right, exactly it’s more intimate and the main difference– all these conferences have a different appeal. Now podcast– in podcast conferences you are not going to get any pitching, there’s you know– it’s not like all big name speakers, obviously there are well known speakers in our industry there but it’s more about tons of just content and no sales, you know no sales pitches and so I really love, it’s a lot of networking, relationship building with your target audience. Jessica: That is so and you can meet some really, really well known celebrity entrepreneur at these events like I met Dan Kennedy, I met Lisa Sasevich at the last one, so it’s a good place to go to meet people but what I love about dream business academy is in a much more intimate experience, there is a live master mind and master minding is just such a powerful way to build your business because you get this direct face to face feedback from other entrepreneurs. Steve: Okay, I’ll have to link up all those shows, I’ve actually haven’t been to any of them. I plan on going to New Media Expo one of these years but you know yeah those are definitely good conferences and I’m definitely going to check out. So, I want to switch gears a little bit and kind of talk about the very beginning when you kind of first started out, you just quit your job, you had no idea what the heck was going on, how long did it take you before your business gained traction and I understand your dad was a huge part of that but what are some of the key mistakes early on that you want to pass on to my listeners so they don’t make the same mistakes? Jessica: So, yeah it took a while before it gained traction. Now anyone who has quit their job and started a business, you know there is a long period where you really need that kind of, that safety net, that savings I mean I will be very clear I used– I still use you know credit cards and you know we have a big savings account that we pretty much diminished into the first few months of the business, I mean it’s really, really hard and you know we only have two years in, I’m doing pretty well but personally we’re still we’re still working and we’re still getting up to where we want to go in the business. And so I would say like I remember I guess March was when March 2013 is when I was like full time with my business and then that summer I remember actually being on vacation– a family vacation and my husband and I were having a conversation. It was very, very challenging and I know that I’m sure everyone looks in especially if you are married with kids and you’re starting a business and you’re trying to make it work if– especially if your spouse is not an entrepreneur and they are supporting you but it’s still kind of like “listen, you need to start making more money”. I mean I just had so much optimism and believe and faith in my business that I’ll be successful, but it wasn’t quite successful at that point. I was still like not making a lot of money and just kind of you know I probably had like I don’t know couple thousand dollars a month coming in but that’s really not that much and yeah so it was just– it was very, very challenging looking my spouse in the face and just saying like I don’t make much money now but I will, I will just keep believing in me and he’s like that’s one more credit card we’re using to buy [Inaudible] [00:35:38]. Definitely it is a test there, but I forget it was no question, I guess it took a while before things started getting– getting safe. Steve: Okay, yeah you know it’s funny I actually forgot my original question also. It was something along the lines of mistakes that you made early on. Jessica: Oh great, mistakes that I’ve made. So, I can’t– like I don’t have any huge business fix because quite honestly I’ve been in business under two years, so I know like there is a lot of great interviews so I’ve heard of people abuse ginormous business failures and I haven’t quite undergone something that has been like hugely traumatic. I just had a lot of little lessons along the way like I– the big– the most clear one that actually I use in certain simple and another interview where they asked me is I tried to– when I started investing in virtual assistances, I have a team of virtual assistants I mentioned I’ve got designers and people on my team that help me now with a lot of that work. I basically tried to save money by getting really cheap on Elance, and that kind of bit me in the but a lot because I wasn’t delivering really low quality work to my clients and it was a problem. It was a ginormous problem, I have very understanding clients and we would fix it right away and I had other people to turn to who could fix it but just a lesson if you are going to use a virtual assistant, don’t try to get someone who is very cheap because you think you’re going to save money because I can tell you, I guarantee you, if you get someone that’s really cheap more times than not they’re going to cost you more in frustration and mistakes that you need to fix. It is worth it to invest in a virtual assistant and a designer who cost a little more money but is not going to have to fix mistakes and you know produce work that’s going to be bad. Steve: Okay, yeah that’s good advice I mean I think we’ve all been bitten by that bug. I’m a pretty cheap guy and I usually try to skimp on stuff but just over time I’ve learned that it’s just not worth my time. Jessica: Yeah and I do have really affordable graphic designers, you just have to find them. Like I have people in the Philippines and some other countries overseas that really do great work and they are not very much money at all, but if they are– you know you really got to find them, you really got to search. Steve: So, where did you find those people? Jessica: I still found them on Elance. Steve: So it’s just a longer vetting process I guess. Jessica: Yeah, exactly and be very clear about what you’re looking for, have a very clear job description and just Tim Ferriss skimps a lot in his tips in his book ‘The 4-Hour work week’. He has a whole section where he talks about how to work with overseas virtual assistants, be very clear about your deadlines, due dates you know what– because of the very long time zone difference what a due date to you just saying the date might be like different for them because there’s like 12 to 15 hours time difference. So just being super, super clear on what you need. Steve: Okay, and one thing I also want to ask you is I notice with your booking is that you’re kind of extremely hands on with your business and interview booking, and I was just curious what your plans on for scaling that because it is a lot of hands on work. Jessica: Yeah, Steve oh my gosh we could just have a whole coaching session here if you want, with you coaching me maybe. Now that is exactly what I’m at right now Steve is I have gone to the point where I have been able to outsource a lot of my business in terms of the designs and with interview connections they are in different parts, so there’s actually finding the guests and securing the interviews and then they are– we confirm the recordings, we get the graphics made. So after the guest interviews are booked and secured, there is a lot of work that’s done after that in terms of just making sure the interviews are scheduled, making sure we get their bio and their [Inaudible] [00:39:28] and all that. So I have a virtual assistant team that takes care of all that, but it’s still me that actually is the brains of finding the guests and that’s really where I’m at right now is I can handle it all, but I know there’s going to come a point where I am going to need to have somebody else who can help me find guests because that really is my challenge right now, is that I obviously I have a guest data base where I look for ideas. But most of the time if I– you know with my clients when they request an interview, when they need a guest I just think about it first because I just– I really have a good memory and I think if that person is really good here– so that’s really bad, the challenge is I will need to have somebody on my team who also is very connected in the online, mostly online marketing, but connected in the entrepreneurship world tabs and scales, some sales experience. So if you are that person feel free to reach out to me. Steve: Just curious also and this is just really for my own knowledge, how do you actually vet the people that are coming to you. So for example you won’t want to necessarily book someone who’s not very interesting to someone who is looking for really high quality people? Jessica: Sure, yeah so with my podcasting clients, I have to fill out podcast details form. They tell me who their audience is, I want to know who your abettor is, so I’ve had some clients or potential clients talk to me and I say who is your abettor and they have no clue, I say well come back to me when you know because I can’t book you guests if I don’t know who your ideal audience is. So that’s really important to know, I want to know what your goals of the podcast now. If your goal is to connect with potential clients, people are really kind of on your level. Like Steve, you’re show is just such a perfect example because you were so clear that you were not just bring on these big celebrity entrepreneurs to talk about their wild successes. You really talk about the bootstrapped entrepreneurs which I seriously absolutely love. That really stands out to me because it’s very clear to me who you’re trying to target and with your– you know I know you have training, coaching programs on how to start a store– I mean every single guest that you have on is probably an ideal target client for your programs. So, your model is just like really, really well done. So that’s a really good thing I mean, so knowing what your goals are, knowing what kinds of people that you want to interview, I mean I have some clients that want to interview people with as big audience as possible, so I try to find guests that have– you know I look at their portfolio, their social media following, how big they are. But I also have to understand that if the client is just starting their podcast, they’ve got two people listening, big celebrity entrepreneurs are not going to be on that show. So I have to– part of my challenge is as their interview connections podcast booker, I have to help them set clear expectations is that you know I can help you get a really great guest but just because you hire me doesn’t mean I’m going to get you Michael Jordan. Steve: Okay, yeah that’s what I was getting at actually. Okay, cool and you know we are kind of coming on 40 minutes and I don’t want to take up too much of your time but you mentioned like a whole bunch of services during this interview. In terms of the ones that are specifically focused on expanding your own business, what online services do you use fro you business that you just can’t live without? Jessica: I love this question, okay I love Base camp. Base camp is what I use for– I would literally interview connections would crumble without it. And Base Camp is amazing, I just, I really love it. Also Robo Form, if you don’t have a Robo Form with something similar. What Robo Form does is it saves all of your user names and passwords, say for example you are going through a website you’re logging in for the first time, Robo Form will capture that information so you never have to remember any passwords or usernames. It’s amazing, it just types it in for you– I could not live without that software. So those are good two and obviously I use Skype, I’m not Skype in Gmail all day long. I know I need to not be on emails as much as I am but I say I’m not perfect. Steve: Do you usually use specific tools to help Pinterest at all, just curious? Jessica: Yeah– no good point Viral Tag. Jessica: Viral Tag is something you definitely want to be using because it schedules your pins. Jessica: So, with Pinterest and I can’t prevent it to mention that there are times of day that are best to be adding your pins to Pinterest because more people are using it. So Monday through Friday, 8:00 to 1:00 AM Eastern time is the best time to pinning because everyone sits on their couch with their laptop browsing Pinterest at that time. And also Saturdays are great to be pinning. Steve: Interesting, okay so everyone is doing it after work essentially. Jessica: Yeah, I mean obviously like if your target audience is someone that’s going to be on during the day, then you could obviously adjust that and you don’t want to totally miss out on people that are on other times. You’re going to switch it up, the verdict’s kind of the all cross the board know static is that Pinterest has the most traffic at those times. So simply, simply you don’t want to be pinning at the night. Use Viral Tag and schedule your pins, so I got the point early on in my business I was on pretty much Pinterest all the time pinning for my clients but now I can schedule the pins and not have to worry about it for a few days. Steve: Okay so you schedule on multiple days in advance? Jessica: Yeah you can schedule I mean you can upload tons of pins and just schedule them out, you can set dates and times they go up. Steve: okay, that is cool. I’ll definitely have to check it out, I’m pretty sure my wife is not using that service right now. She actually just enjoys the pinning process. Jessica: I know and that’s the other thing, like if you just like being on Pinterest then do it, if that’s the one thing that you are doing definitely do it, but if you’re a busy entrepreneur, that you have a lot of things on your plate, you don’t actually have time to be on Pinterest all the time, it is a very useful service. They’ve got monthly rates and then you know you can pay like 200 for the year and save a couple of bucks. Steve: Okay, so it’s really inexpensive for the service. Jessica: Yeah, it’s not that bad, for me it was worth it because of the time I would save. Steve: Okay, well hey Jessica thanks a lot for coming on the show. If anyone wants to find you online where can they contact you? Jessica: Sure, so my blog is EntrpreneurSupportServices.com and I have a cool new web TV show video podcaster InterviewConnections.tv. Steve: Okay, cool I have to check that out. I didn’t find that earlier, and you know once again just my own little pitch for her if you are looking for guests to interview or the other way around, I highly suggest that you go check out her site which is InterviewConnections.com. Jessica: Thank you so much. Steve: Well hey thanks a lot Jessica; it was a pleasure talking to you. Steve: Like I said earlier I really admire Jessica for her great and her work ethic. She reservedly wants to spend more time with her family, so she quit her job cold turkey so she could start a business and that’s definitely not for the faint of heart. And she basically hassled her way to the top, became an expert in Pinterest and various other business related disciplines. Now personally I know that I learnt about Pinterest from this interview. For more information about this episode go to mywifequiteherjob.com/episode32 and if you enjoyed listening to this episode, please go to iTunes and leave me a review. When you write me a review, it not only makes me feel proud but it helps keep this podcast up in the ranks so other people can use this information, find the show more easily, and get awesome business advice. It’s also the best way to support the show and please tell your friends because the greatest complement that you can give me is to provide a referral to someone else either in person or to share it on the web. Now as an added incentive I’m also giving away free business consults to one lucky winner every single month. For more information go to mywifequitherjob.com/contest. And if you are interested in starting your own online business be sure to sign up for my free six day mini-course where I show you how my wife and I managed to make over 100k in profit in our first year of business. Go to www.mywifequitherjob.com for more information and thanks for listening. Great podcast! That’s a fascinating business idea, connecting people with podcasts, I love it. I suspect it is a growing market, too. Thanks for sharing with us. Thanks for having me on the show Steve!! Great podcast filled with great info Jessica and Steve! I think the tips on using Pinterest alone were invaluable. I’m hopeful that I can finally figure out how it will help us with our business. I did try the link to Pictochart and was bummed at first that the domain was listed for sale with GoDaddy. I quickly found out that it’s actually http://piktochart.com/ and I am excited to try it! So many great tips in this episode! Thanks for sharing your story Jessica – you are truly an inspiration!